The great documents in this important collection helped form the foundation of American democratic government. Compelling, influential, and often inspirational, they range from Patrick Henry's dramatic "Give me liberty or give me death" speech at the start of the American Revolution to Abraham Lincoln's Second Inaugural Address, issued in the closing weeks of the Civil War. Also included are the Declaration of Independence, Thomas Jefferson's classic rationale for rejecting allegiance to the government of King George III; the Monroe Doctrine, the cornerstone of American foreign policy; and these other landmark statements: The Constitution of the United States; James Madison's The Federalist, No. 10; George Washington's First Inaugural Address and Farewell Address; Thomas Jefferson's First Inaugural Address; William Lloyd Garrison's Prospectus for The Liberator; Andrew Jackson's Veto of the Bank Bill; and Abraham Lincoln's First Inaugural Address, Emancipation Proclamation, and Gettysburg Address. An introductory note precedes the text of each document, providing fascinating background history and information about the author. An indispensable reference for students, this handy compendium will also serve as an invaluable introduction for general readers to American political writing. Everyone needs to learn more history. 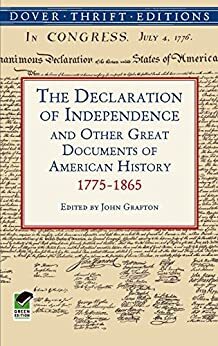 In John Grafton's edited book of great documents of American History, he provides an uniquely handy reference book to the great speeches and documents of our past. Included are both the Declaration of Independence and the U.S. Constitution, with all Amemdments, a document I often find myself in need of referencing, especially in these tumultuous times. I will not list off all the documents in his book, the Amazon review and several reader reviews do list them. But I would note, that Grafton's commentary on Lincoln's composition of the Gettysburgh Address is in accord with the superb work of Gary Wills in his book, "Lincoln At Gettysburgh" where Wills thoroughly debunks the myth that Lincoln wrote the Address on the back of an envelope on his way up on the train. 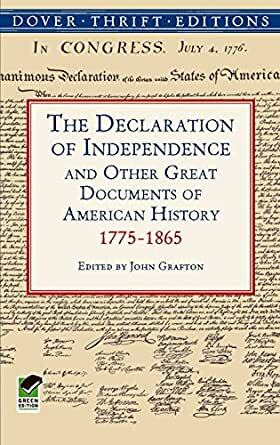 Anyone who has frequent need to reference some of the greatest and enduring documents in American History will find this book an invaluable reference tool. 5.0 颗星，最多 5 颗星Keep this on your bookshelf! This is a collection of documents and speeches that were essential to the founding and values of our country. Each chapter starts with a short introduction and then the document/speech. It's easy to fall into the trap of believing other's interpretation of these documents, but not know the content for yourself. For a few dollars, it's great to have this on your bookshelf. Great purchase, arrived on time and a got a great deal purchasing through Amazon, my son is enjoying it already. Good quality book, and I'm glad I purchased.